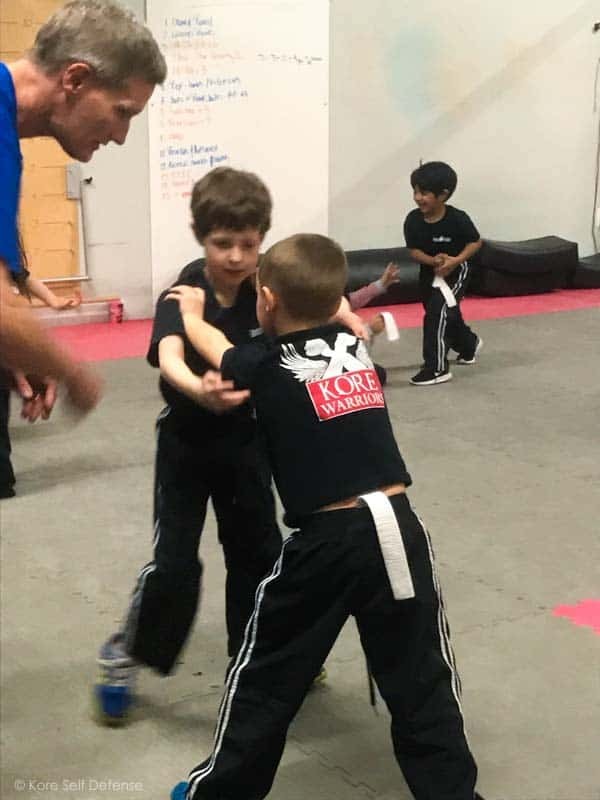 Kore Warriors, our certified KMG Kids & Youth self defense program groups children according to developmentally appropriate training levels. We have Three Unique divisions, Kids, Youth, and Juniors. Each division has 5 ranks that can be earned through a positive grading process. Children change divisions by age, not by rank. At age 13 most teens train in our adult training program. Tuesdays 5:30-6:15 pm, Saturdays 9:00-9:45 am. Once a week is adequate for our youngest students but for the hardest charging of our little ones, two classes is more than enough! Mondays 5:30-6:15 pm, Wednesdays 5:30-6:15 pm, Thursdays 5:30-6:15 pm. For our older warriors, we recommend twice per week attendance as much as possible. If your young warrior is really goal-oriented? Three times a week will definitely show the results! 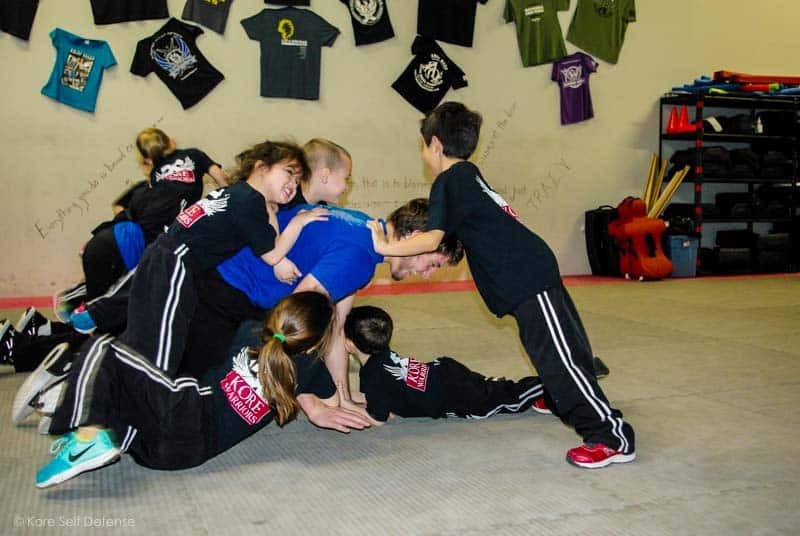 Why bring your child to Kore Self Defense? 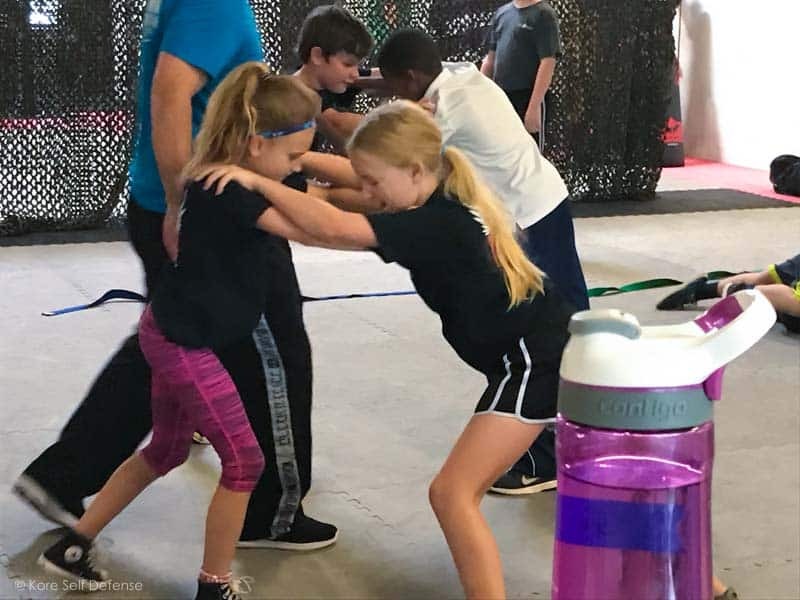 Children and youth who can effectively manage personal conflict (physical or verbal) develop a unique type of confidence; The confidence to live a life with compassion instead of fear. 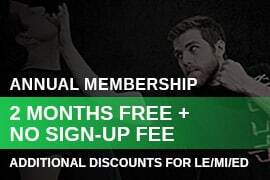 Kore Self-Defense is a premier training center. 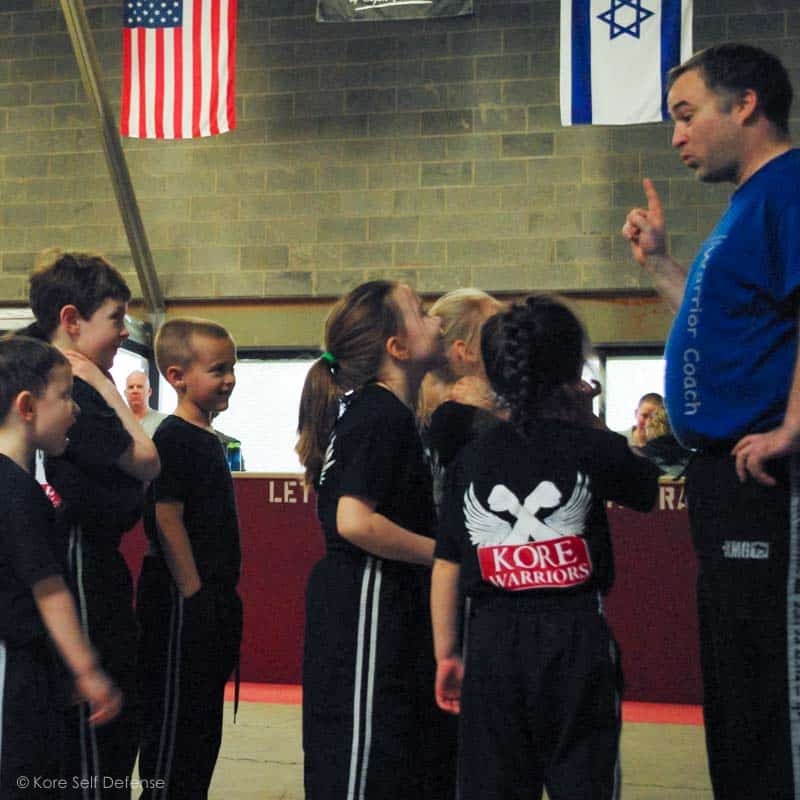 We are the only program in Loudoun County with roots back to Ze’ev Cohen’s youth curriculum originally developed in conjunction with Krav Maga Global. 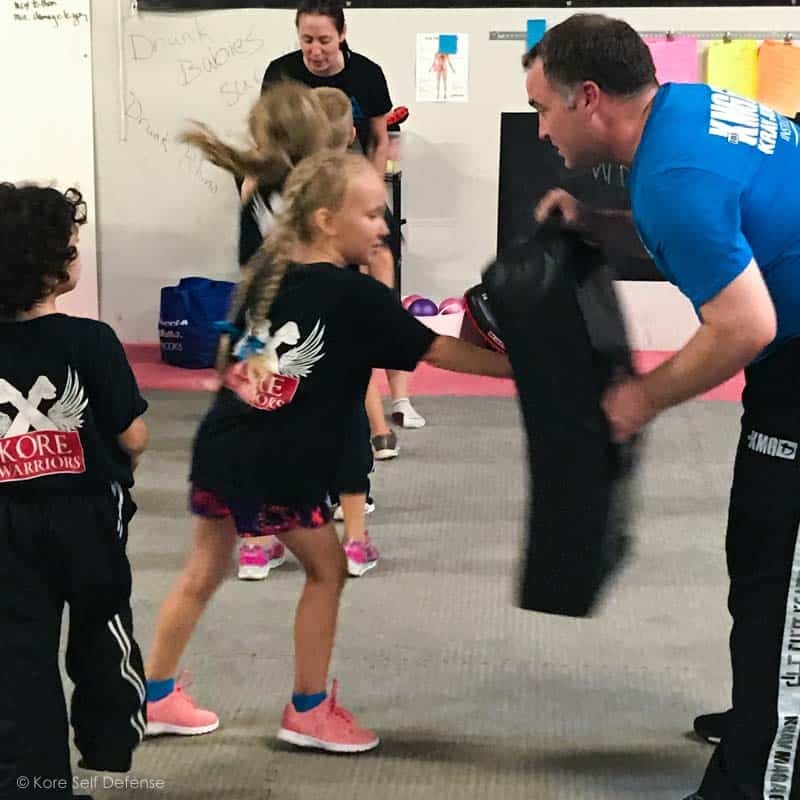 Our Kore Warriors Director, Brian Mason and owner Tammy McCracken have specialized training in youth self-defense, including Krav Maga for children. Our curriculum and class structure is continually evaluated against the needs of our community. The program is developmentally appropriate for each age level and is backed by years of academic, observational, and experimental research with a focus on play-based learning. 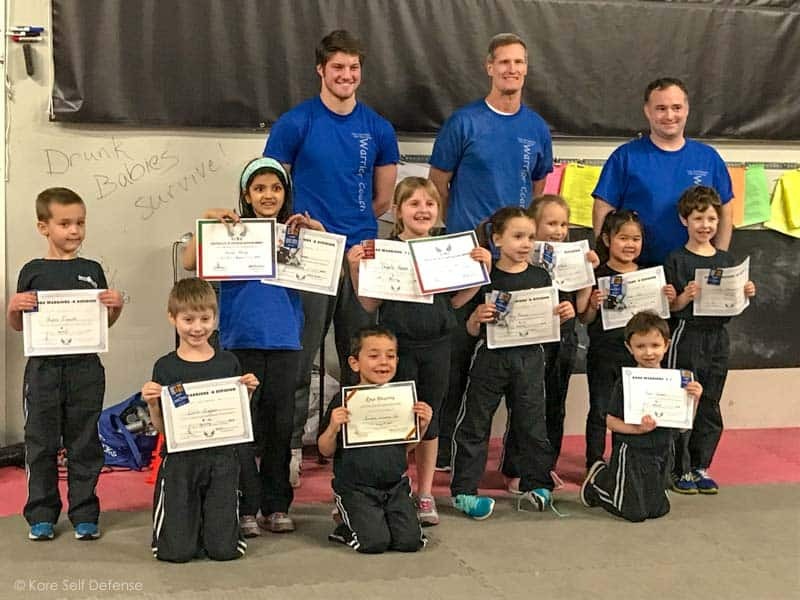 Like traditional children’s programs in Karate, Brazilian Jiu Jitsu and other martial arts, classes integrate discipline, leadership and positive character development. We know cost is an important factor for young families. We are confident in our program and comfortable posting our rates publicly. Please scroll down for all tuition information. 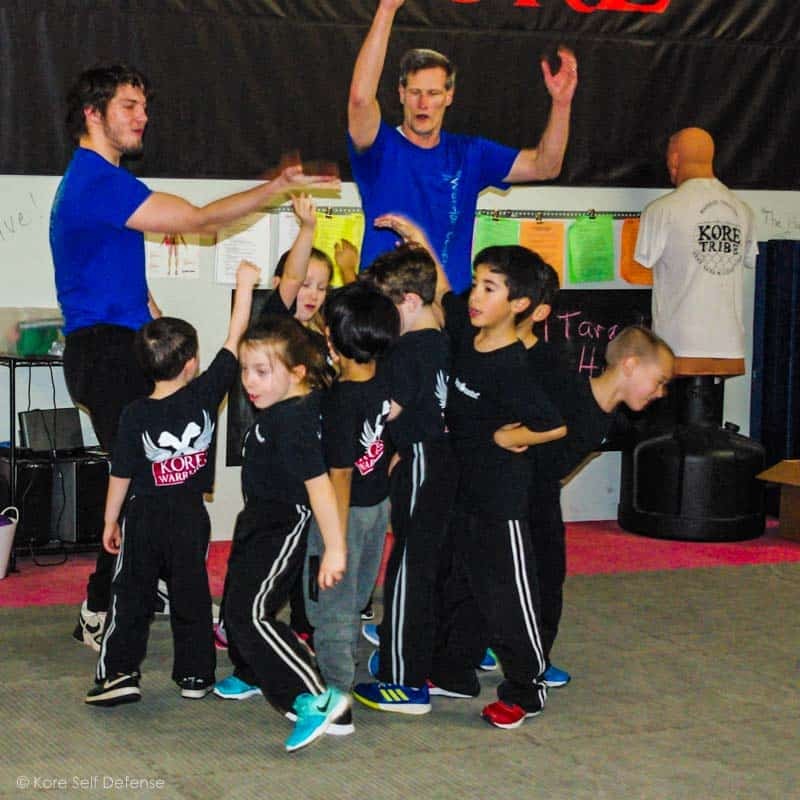 What do we teach our Kore Warriors? Ages 5-7 fall within the K-division. 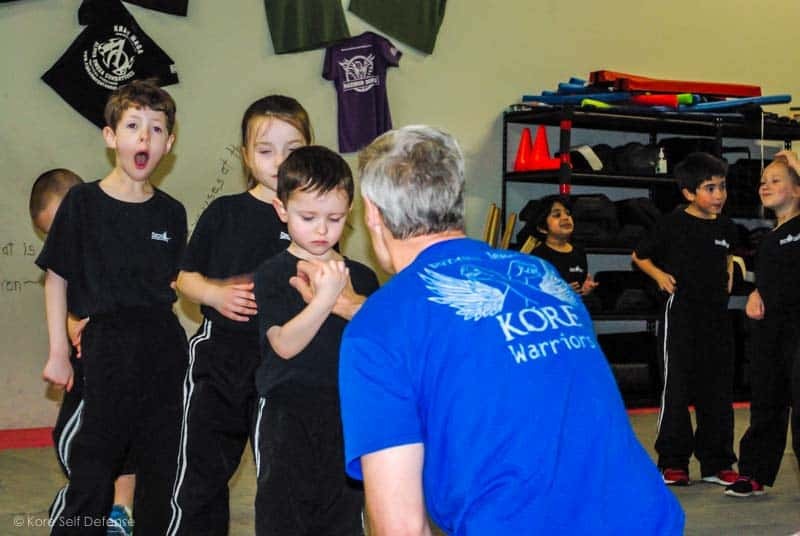 K students may attend two Kore Warrior classes per week. One-time registration fee: $140 includes uniform & one month training tuition free. Students over the age of 12 participate in the adult training program. 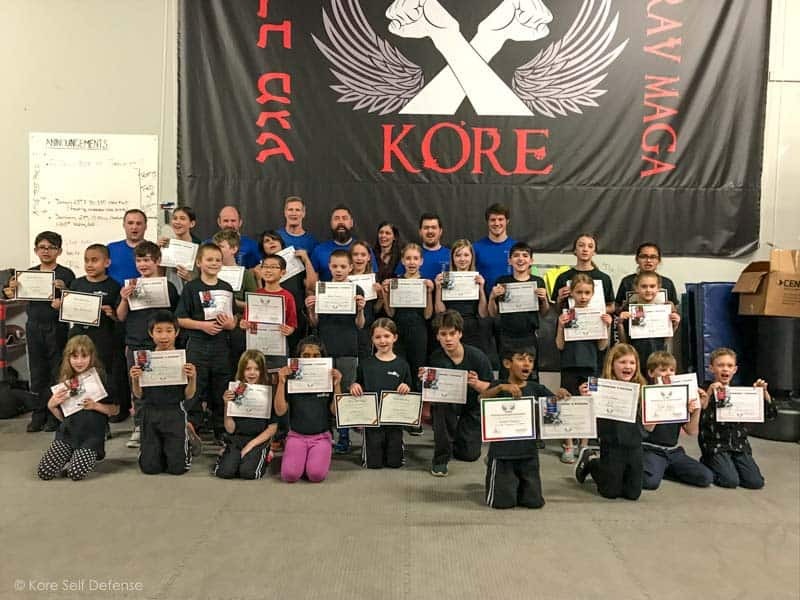 Although teens attend adult classes, they earn rank through the Kore Warriors program or they may choose to test in the adult system. 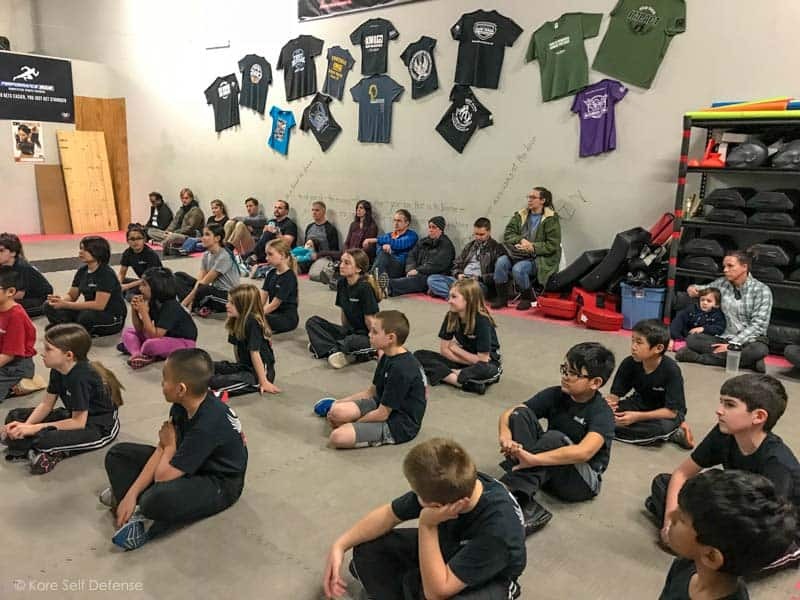 13-15 year old students who prefer to test under adult training standards must get approval from instructors and parents. A 15% discount applies to monthly tuition rates for Teachers, Military and Law Enforcement Families. The 15% discount is automatically included in the one-time payment options. The Law Enforcement discount is also extended to other first responders such as Fire, Rescue, EMS. 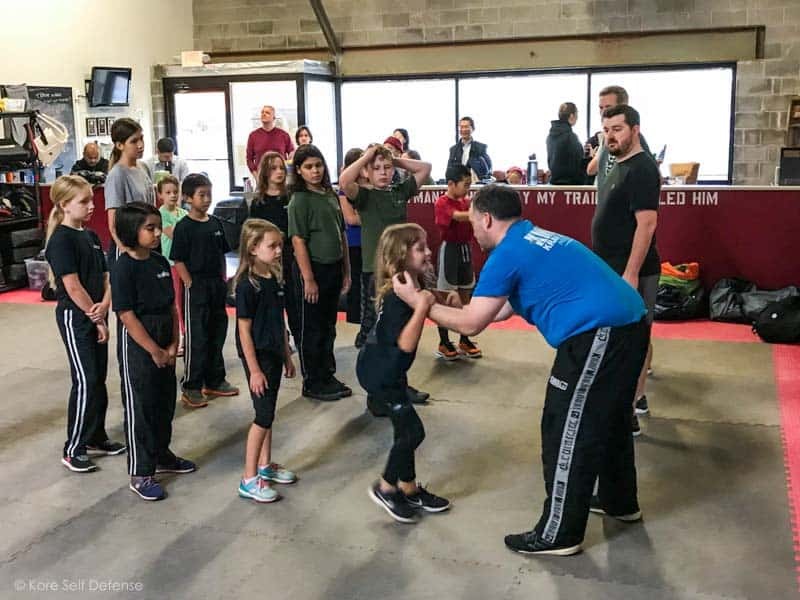 Enrollment: For Registration Instructions & General Questions Contact Director of Operations, Andi Boyer: andi@koreselfdefense.com. Just submit the form below and we’ll be in touch!